There are a couple of insights that can be gleaned from rewriting the Plan – Do – Check – Adjust (PDCA) cycle in a different manner. 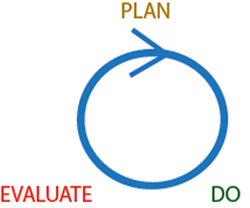 Although the check and adjust steps are necessary, for the purposes of the next illustration they can be combined into a step called “evaluate” so that the improvement cycle looks like the clockwise circle with a “PDE” arranged around it. 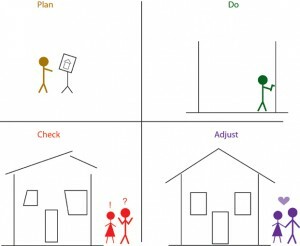 This arrangement implies that planning is the first step in this cycle and that evaluating is merely a check-the-box step. Obviously, this makes no sense. There is no point in evaluating something that you are not going to improve in some manner. 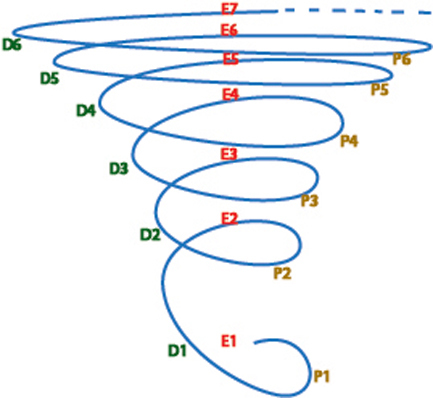 Including the “Evaluate” step makes more sense when viewed in the manner of a PDE Tornado-like-Ascending-Helix (See Helix article), so that the cycles are stacked on top of each other in rapid-execution style. When stacked one upon another like this, the “evaluate” step becomes the link between each successive iteration. However, “Evaluate” is much more than an after-the-fact action. Consider your perspective from the “Plan” step of the first cycle of a tornado. Ask yourself the question, “Why are we focusing organizational resources on this particular project?” Hopefully, you have identified this project as critical to improving throughput in your organization by some combination of increasing your throughput’s quantity or quality, or alternately, by decreasing its risk or hassle. If the project you are presently “Planning” will not accomplish this better than alternative uses of the required project resources, perhaps it would be better to “Evaluate” it to a lower priority in favor of a project that WILL accomplish improving throughput in your organization. Proposal: instead of placing the “Evaluate” step at the end of the improvement cycle, consider re-portraying the rapidly repeating cycle as “Evaluate”, “Plan”, and “Do” (EPD) and then stack 4 to 6 iterations on top of each other in rapidly iterating cycles as an EPD Tornado!